Nicholas Ni This is an official document of naturalization for the United States of a women named Mary Terronez. From this document we can see that Mary was originally from Mexico. The Document details that Mary was born on August 15, 1918. She has brown eyes and black hair. She is 5 ft tall and weights 156 pounds. She also has a scar on her left wrist and is married. Their is also a picture of her on the middle left of the document. We can see how Mary signs a paper by her signature int the middle of the doc. I thought the last letter in her last name was a "y", but i was a "z". [term]. According to the body paragraph in the middle of the doc, we can tell that Mary intends to stay in the United States. This document was approved in the southern district of Iowa. Her address is stated in the paragraph as well as the town she lived in, which was Davenport. 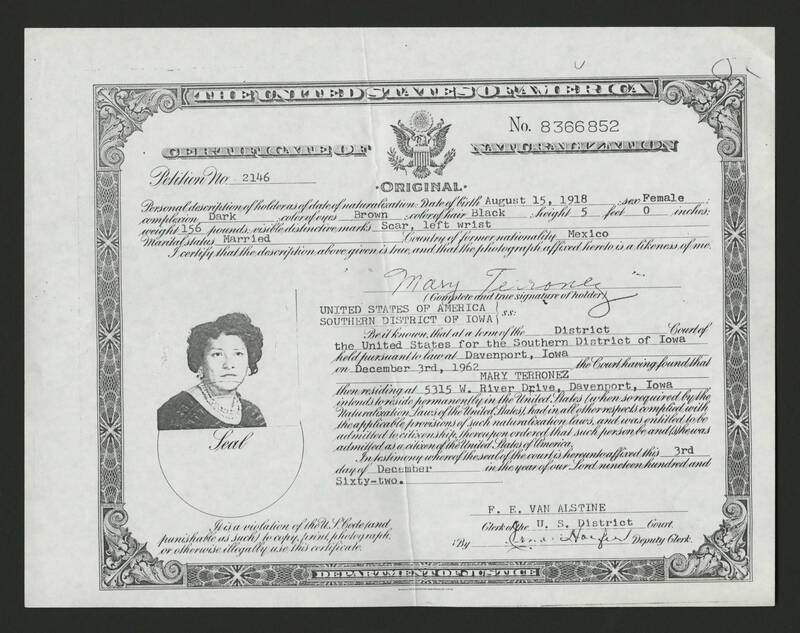 it seems that Mary's naturalization was approved on December 3, 1962. At the bottom, the doc was signed by the deputy clerk and issued by a clerk of the U.S. District court named F. E. Van Alstine. There is a seal on her picture to prove the doc's realness or eligibility. I forgot to mention, in the top right of the doc, you can see Mary's certificate number and her pillion number to the left. Last but not least at the bottom left of the doc, it is written that if someone else tries to copy, print, photograph, or use this certificate, that person will be punished.